On any self build boat project, one of the first and most important decisions you'll have to make is the choice of hull material. Your final choice will be made on the hull material's suitability for the type or size of boat you have in mind, and your own familiarity and skill level with that material. For instance, you wouldn't choose steel for a 25 foot sailboat - it would be way too heavy - nor would you go for aluminium if you didn't know how to weld, or weren't prepared to learn. Sailboat hulls should be both strong and rigid. A fairly obvious requirement you may think, but it isn't always the case, particularly with lightly built GRP hulls. Out of the water, a boat should be capable of taking all of its weight on its keel without undue hull distortion. 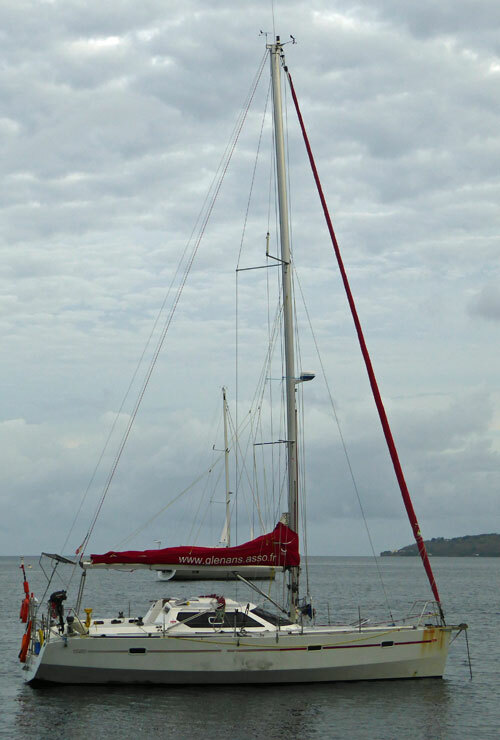 Afloat, hardening-up both the forestay and backstay should create only minimum distortion. Of the four basic materials - GRP, metal, wood and ferrocement - GRP (glass reinforced plastic) is the material of choice for production boats. Glassfibre, as it's almost universally known (fiberglass in the US), is in its basic form polyester resin reinforced with chopped strand mat. Modern GRP designs employ more sophisticated laminates, often incorporate layers of stronger woven glass rovings or exotic materials such as aramids (Kevlar, Twaron) to build in additional strength where it's needed. Fibreglass lends itself to mass production techniques as, through investment in moulds and automated tooling, labour costs can be kept to a minimum and hulls of consistent quality produced in high volume. Clearly, it's not the material of choice for self build boat builders. The cost of building a plug, then the mould, would make the whole venture totally uneconomic for a single hull. But buying a completed hull and deck moulding for fitting out yourself is a viable option for self build boat construction. 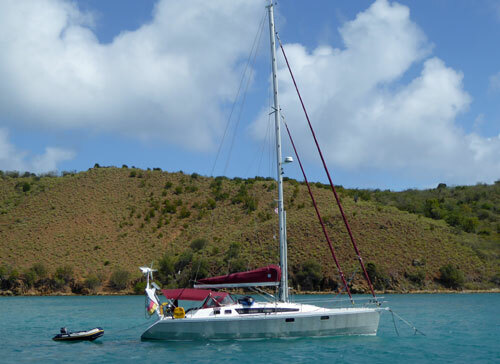 A favourite choice of material for the amateur or one-off builder, not just for the inherent strength of a metal hull, but also because of the relative low cost of the raw material and the ease of construction for those with welding skills. 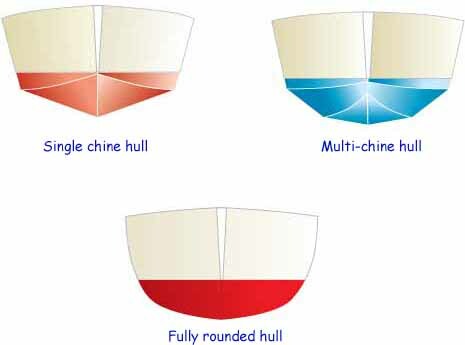 Steel hull designs are either single chine, multi-chine or fully rounded. From an aesthetic point of view, the latter wins hands down. Steel suffers from chemical corrosion in saltwater, so it's absolutely vital to maintain a protective surface coat of a water resistant paint - epoxy being the best choice. Because of its weight, steel is more suitable for hulls of 14m and above, when it becomes a great choice for self build boat construction providing you have the welding skills. Aluminium is more difficult to weld than steel but has the advantage of a better strength-to-weight ratio, and it doesn't suffer from saltwater corrosion. In fact some owners are happy to leave their vessels unfaired and unpainted, accepting with a Gallic shrug the appearance of the protective coating of aluminium oxide that quickly builds up. But aluminium is susceptible to electrolytic and galvanic corrosion by contact with dissimilar metals, or through improperly designed or installed electrical systems. Sacrificial zinc anodes are essential to keep galvanic corrosion at bay. Many owners, wary of stray electrical currents, choose to dangle a few additional ones over the side when in marina berths but a better form of protection would be to fit an 'isolating transformer' or a 'galvanic isolator' so there are no interactions with the marina's shore supply. 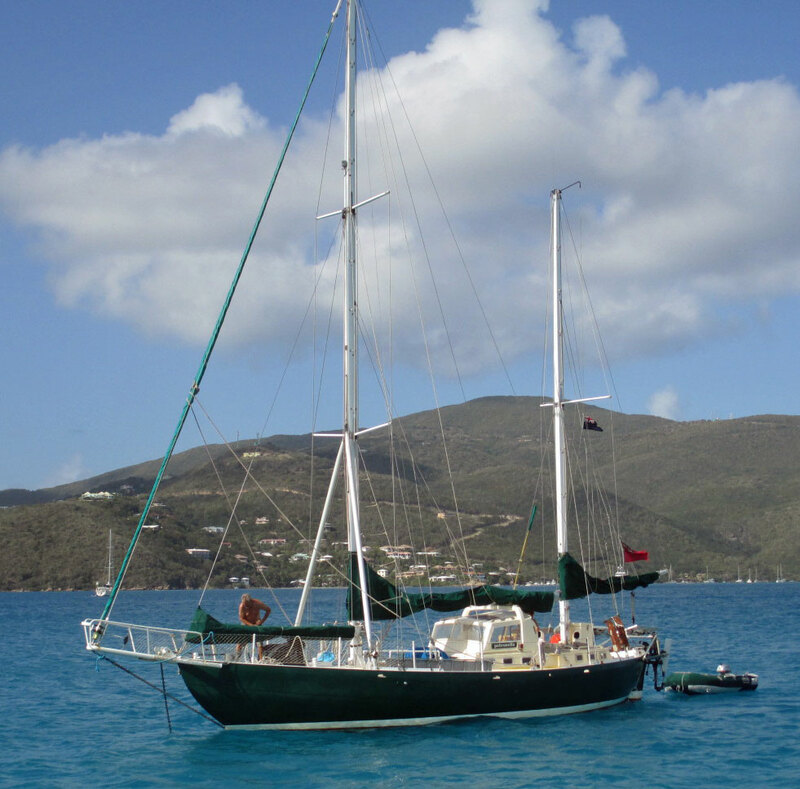 Modern wooden hulled cruising boats are usually strip-planked and epoxy sheathed. 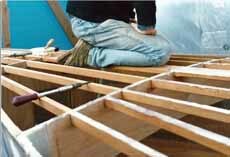 This technique lends itself to custom self build boat construction as no moulds are required, the hull being built upside down around temporary timber frames. 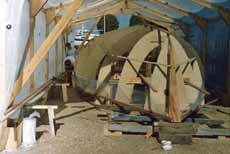 The planks are glued one to the other with epoxy, and the completed hull is sheathed in layers of woven glass rovings and epoxy. 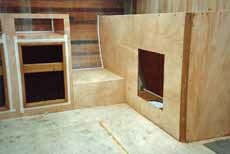 Such hulls, more often than not of western red cedar, are light, strong and stiff, and require little maintenance. 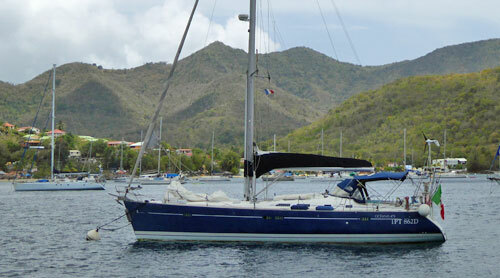 It was the one we chose for our sailboat Alacazam, seen at the top of this page creaming along towards Antigua. Being completely sealed, rot - the enemy of traditional wooden hulls - is not an issue. It's a great choice of hull material for self build boat construction. 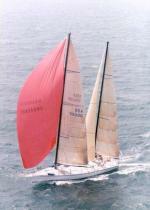 A RM1050 cutter-rigged epoxy-ply cruising boat. 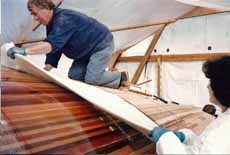 However, in recent years epoxy-impregnated plywood hulls are being produced. The light displacement RM1050 shown here is a typical example, where its open plan interior is made possible through the use of a galvanized steel framework. We're back in heavy displacement territory here. Hull construction is an internal steel mesh structure plastered with a sand/cement mortar. Although the process is labour intensive, the construction materials are comparatively inexpensive, making them an attractive building option to someone with more time on his hands than cash in his pocket. Occasionally you'll find a completed ferrocement hull on the secondhand boat market. 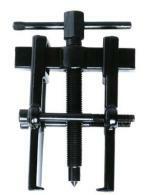 Odds are it will be at a very attractive price, and may seem perfect for fitting out to your own requirements. But beware, because unless it's been built by a specialist boat builder skilled in the technique, you could be letting yourself in for a heap of problems downstream. 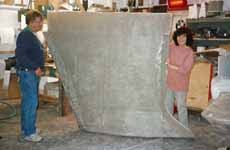 The quality of a ferrocement hull is totally dependent on the manner in which it has been built. If the hull has been poorly constructed, for example with voids left in the mortar or with inadequate bonding to the mesh reinforcement, then it will be structurally unsound at best and may be very weak indeed. Ferroconcrete boats are difficult to insure at reasonable premiums, some insurance companies being unwilling to provide cover at any price. As a result resale values are low. But as a material for a self build boat project, particularly for cruising hulls of 45 feet (14m) and over, ferrocement could be a good choice. 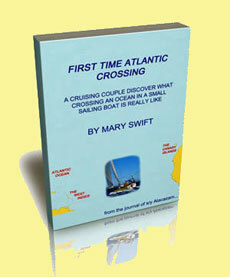 Thinking of Your Own Self Build Boat Project? 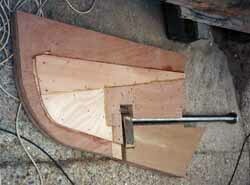 Here's how we started out on 'Alacazam' our own Self Build Boat Project!